There is an image going around the internet of these ivory petal taffeta tablecloths set out in a garden, and underlit with a beautiful warm glow. I loved it, and it looks like a lot of others did too! It has been pinned a bunch of times. When a local wedding planner asked me if I could add them to our rental collection, I jumped at the chance. We now have Ivory Petal Taffeta tablecloths in an 120 inch round for rent! (If you are interested in another size, contact us!) I am also working on that underlighting in the first photo, if anyone is interested in that as well. This is going to be a short round up of inspiration photos, as there really aren’t a lot of photos out there yet of these petal taffeta tablecloths being used in weddings. That means you could be one of the first! We have already used them for several photo shoots, and the textural quality of these tablecloths is amazing as part of the overall decor. Each week(ish) I will be bringing you images from around the web that are focused on items you can rent from Ultrapom. I hope they demonstrate how Ultrapom can help you get the current trends for less! 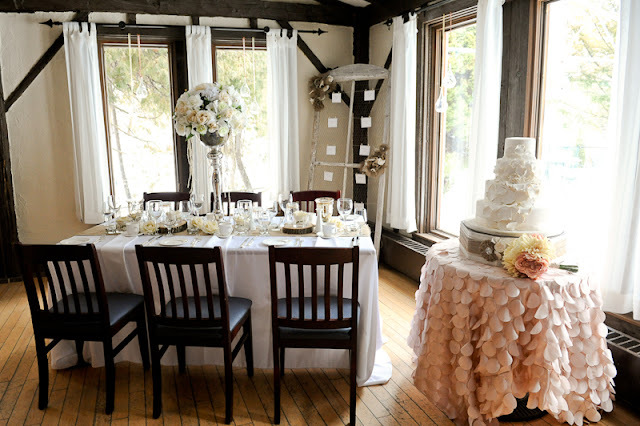 This entry was written by carolynpom, posted on at 6:15 pm, filed under BLOG and tagged ivory petal taffeta, linen, ruffled tablecloth, tablecloth. Bookmark the permalink. Follow any comments here with the RSS feed for this post. Post a comment or leave a trackback: Trackback URL.